Throughout our history, NRCM has worked to support healthy fish populations returning to Maine’s rivers, and we’ve had big victories. 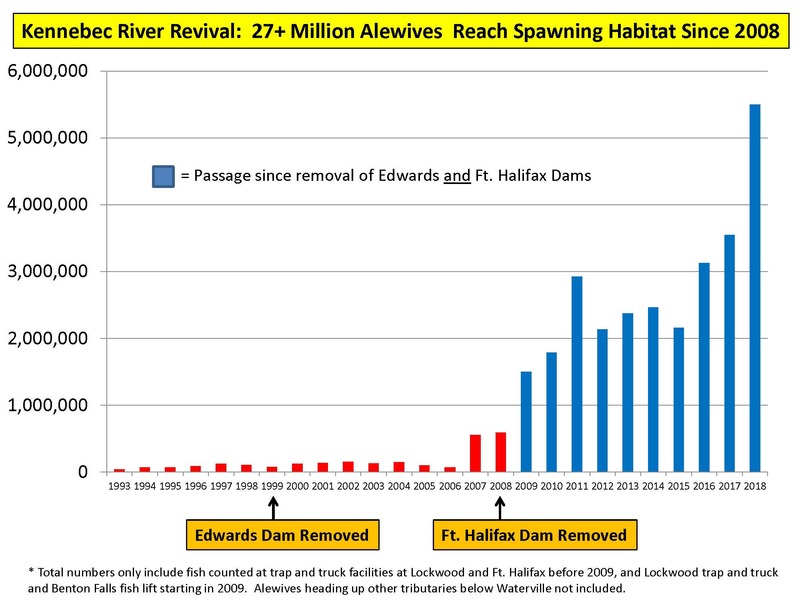 With removal of the Edwards Dam in 1999 and the Fort Halifax Dam in 2008, millions of alewives (river herring) now return to the Kennebec River each spring. “Restoration of Alewives in Maine Rivers is No Fish Tale’” – a blog post about NRCM Staff Scientist Nick Bennett’s latest visit to the Benton Falls alewife run in Central Maine—the nation’s largest alewife run! The Penobscot River Restoration Project, completed in 2016, is also providing tremendous benefits for alewives and the full range of fish and wildlife in the Penobscot River and throughout the Gulf of Maine. Alewives in Maine rivers are sometimes referred to as “the Purina Chow of the sea,” serving as a critical food source for many valuable fish species including salmon, striped bass, bluefish, cod, and haddock. Maine scientists have linked the disappearance of coastal cod stocks to the dramatic decline in the number of alewives compared to historic levels. Alewives spend their lives at sea but swim up rivers to spawn in the spring. Large numbers of cod used to follow these fish close to shore where they could be caught more easily, supplying the Maine fishing industry with a lucrative catch. Alewives are also the preferred spring bait for Maine’s lobster industry. They are particularly important now because the federal government has had to dramatically lower the allowable catch of other local bait fish. With fewer alewives and other bait fish available, Maine lobstermen must import bait from out of state, which is expensive and increases the likelihood of importing exotic diseases. Maine lobstermen have even had to resort to using cowhides at times, due to bait shortages. In the 1980s, more than 2.6 million alewives traveled up the St. Croix River to native spawning habitat in upstream lakes, but the number of returning alewives collapsed to less than 1,000 fish after the Legislature closed the Woodland and Grand Falls dams to alewives in 1995. 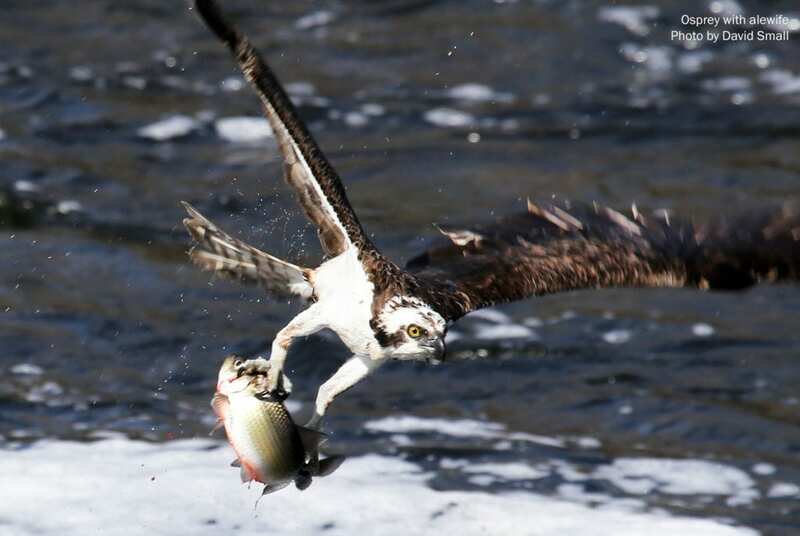 Osprey and eagle populations also plummeted in the St. Croix estuary, and there have likely been negative impacts on all the other species that feed on alewives, such as whales, dolphins, otters, mink, and the valuable fish species that rely on alewives as food. Lawmakers took this misguided action in response to smallmouth bass fishing guides who believe that alewives might harm the smallmouth bass, a nonnative species, that live in the upstream lakes beyond the Grand Falls Dam. But there is no scientific evidence to support this claim. In 2008, the Legislature debated the question of opening up the St. Croix River to alewife passage but failed to take the necessary action of requiring that both the Woodland and Grand Falls dams be opened. Instead, a law was passed directing that just the lower Woodland Dam be opened for alewives, which provides access to only about two percent of the historic spawning habitat for this species. In 2013 the LePage Administration announced that it only supports passage of a limited number of alewives beyond the Grand Falls Dam. NRCM opposed that approach, which is not based on science. In 2013, NRCM urged the Maine Legislature to act to overturn the 1995 law that blocked upstream passage for alewives in the St. Croix River. LD 72, “An Act To Open the St. Croix River to River Herring” passed and became law in April, 2013. Alewives and smallmouth bass coexist in water bodies throughout Maine and the East Coast of North America. Scientists at the National Marine Fisheries Service and the U.S. Fish and Wildlife Service support the free passage of alewives throughout the St. Croix watershed. All of Maine’s tribal leaders support free passage for St. Croix alewives. And NRCM was joined by the Maine Lobsterman’s Association and 50 other fishing, conservation, and First Nation organizations in the U.S. and Canada, to call for full restoration of alewives in the St. Croix. Opening up the St. Croix River for alewife passage should eventually produce an annual run of about 20 million fish, which will provide huge benefits for ground fish in the Gulf of Maine. With an alewife potential equal to that of the Kennebec and Penobscot combined, the St. Croix could be one of the best sources of bait for Maine lobstermen. NRCM Staff Scientist Nick Bennett speaks about the importance of alewives for a healthy economy and watershed on TV's "Wildfire."